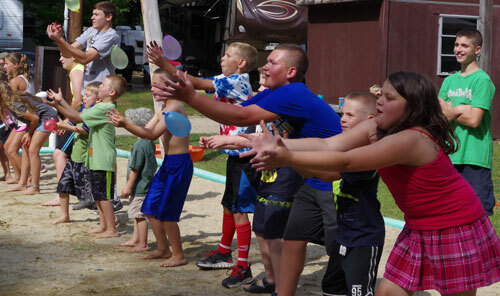 There's always plenty to do right here at Woodmore Campground. Woodmore is Open for camping in early May and closes on Columbus Day in October. Enjoy amenities at Woodmore including Basketball, Arcade, Wiffle Ball, Swimming Pool, Playground, Bocci, Horseshoes, Volley Ball, Lake Fishing, Boat Rentals or planned events at our Pavilion. Daily Adults can enjoy Adult Swim Hour 3 - 4 pm. Toddlers in appropriate swim wear learning to swim are welcome with a parent, all others under age 18 are asked to leave the pool area from 3 - 4 pm and enjoy other activities in the campground. Craft Activities - Mother's Day, Father's Day, July 4th, Christmas in July, Easter in August, Red Neck Weekend etc. Armed Forces Weekend in May Woodmore offers free camping for Active Duty Armed Forces Members. In Spring and Fall join others for an Appetizer Mix & Mingle in May where you bring an appetizer to share. Come to our Chili Cook Off in September where 25 others cook crocks of Chili. Or we welcome you to join in at a Fall Pot Luck Dinner or Souper Saturday Pot Luck. Summer BINGO – win prizes that will keep you covered for summer, bug spray, sun screen, games, coupons for free camping or firewood. Other theme BINGO weekends include Game Board Night, Movie Night, Back to School BINGO. And our most popular Candy Bar Bingo every weekend there is not another kid event planned. Kids and Adults welcome to enjoy Red Neck Weekend, Field Day Games Weekend, Pinewood Derby Races, Rain Gutter Regatta Races, Glow Parties, Flash light & Glow Parades, Holiday Bike Parades, Christmas in July, Easter in August, Annual Wiffle Ball Home Run Derby in September, Annual Chili Cook Off, Prom Night Halloween, Adult Money Bingo Nights and more. Inquire about events during your stay, or check out our events schedule on Facebook.